The news, trials and tribulations of the best classic motoring event in the UK. 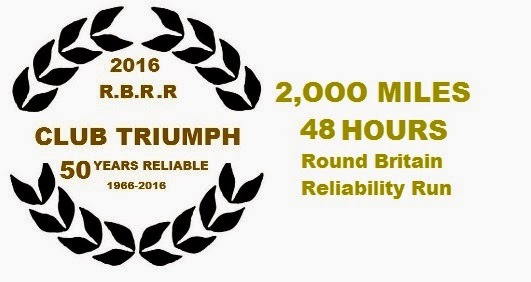 Non-stop for 2000 miles and 48 hours in a Triumph motor car. London to John O'Groats to Lands End to London. DEL LINES..Weston Super Mares Finest! Any crew member participated in the RBRR? We will not wish to see any legal documents for example MOT Certificates, Insurance papers or vehicle ownership details, however you will be asked to sign at the start to confirm that you do hold current documents at the time of the event. Refusal could mean exclusion from the event. Please remember principle entrant should be a member of Club Triumph at the time of the event. Please enclose a cheque to the value of £…….., being the entry fee of £100.00 per crew member, returnable if entry withdrawn before 31/08/16 (Min. entry is £200.00). Cheques payable to: Club Triumph Limited. On receipt you will be sent entry acknowledgement by e-mail. Please fully complete the above form. Part completed forms will not guarantee entry, these will be held on a Reserve List until full details are made known to the Organisers. We regret having to insist upon this, so much time has been spent in the past chasing up Entrants to obtain full entry information. Please do not complete the form using ‘Bogus’ information, this is outside the spirit of the event.